Well who saw the events that transpired at the DW Stadium happening this afternoon happening before the traditional kickoffs in the Premier League? Throughout a frustrating Saturday for me (more on that later), the only thing that has brought a smile to my face was hearing about the events that were transpiring in Ian Holloway's first game in charge of a Premier League club. 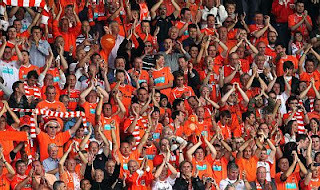 As you saw on Thursday, I didn't give Blackpool a snowballs chance in hell of picking up three points. Ollie, I would just like to take this opportunity right now to personally apologize to you in public. I do feel, in a way, for Roberto Martinez. During ESPN's World Cup coverage, he was the most reasoned analyst on the network. However, his stubbornness to only play at one speed is either going to cost him his job, or see the club relegated. While his football was always beautiful at Swansea City, there was a reason his side was never promoted: they simply lost too many games shipping goals. All credit has to be given to the way Ian Holloway set up the squad. While his new signings weren't at the club for long, they blended in well with the talent the club had. They could have easily scored four more, and had one called back incorrectly for offside. Even settling back in the second half, they still found one more goal. 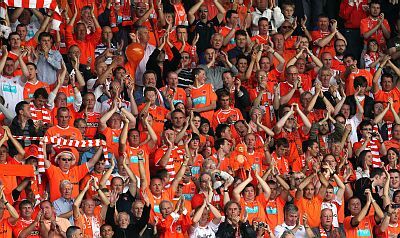 While the future is uncertain about their chances of staying up this year, at least the Tangerines can say they had one hell of a return to top flight football. However, this days boils down to one thing for me: the failure of their 'new and improved foxsoccer.tv'. After hyping this relaunch, the product fall flat on their face. However, as The Third Half editor Jeff Hash told me, 'don't ever doubt the ability of FSI to shoot itself in the foot'. With this relaunch, however, they did just that and more. To start out with, any log in details from the previous season were null and void, meaning you had to re-register. Considering they were moving platforms from Rayv to Perform, I could slightly understand that. However, that's where the fun began. With the payment method only coming from a Netbanx transaction, I could not pay for the service. With Perform based out of London, and Netbanx based out of Cambridge, my Visa card was denied. That's because my bank does not allow for international transactions. Yes, you could say this one is all on me, and I could see that to a small degree. Yet consider this: FSI is creating this service for customers in the United States. The fact that they use a company that some people cannot use, regardless of how high or low the percentage of people that would be, just reeks of complete and utter bull. I had an interesting back and forth with two people on Twitter today about this. The first being Jamie Trecker, the man responsible for the fsctv Twitter account today. He seemed very understanding of my situation, and at least did offer me solutions to help. Granted, none of those solutions helped. The other was Christopher Harris of EPL Talk. He completely forgot that last year, people paying for Fox Soccer TV Online were able to pay by Paypal. That was something that wasn't lost on other people I directly talked to about this issue. The simplest solution, at least from my vantage point, would be to quickly offer Paypal as a payment method. Even if we had to pay an extra dollar or two as a convenience fee, I'd be the sucker who would pay it in an instant to at least get all the games from this season's Premier League. Roberto Mancini picked the right keeper in Joe Hart to start against Tottentham. He simply put up a brick wall in the goal, making at least four incredible saves. While I wonder about how Manchester City will integrate everyone into the attack, this was a good point for them considering they don't get many against Spurs. Now Tottenham have to worry about Champions League midweek, wondering how they will score on the green concrete of the Wankdorf. That's old fashion turf they get to play on there. One moment of stupidity cost Sunderland. That said, Birmingham City showed the fight we got accustomed to seeing them have last season. Steve Bruce has to get the Black Cats discipline record in order and in a hurry. Having seen good friend to the site Kartik Krishnaiyer's tweet about West Ham and Millwall in a derby next season in the Championship, I couldn't help but laugh. He's 100 percent right. I bet Avram Grant couldn't even believe how awful his Hammers looked today. I hope they have more fight than this. Fair play to Aston Villa, after this week of turmoil, for showing the pride they did in a fully functional performance. Chelsea proved that the preseason meant nothing to them. West Brom simply looked abysmal. For Chelsea, this was nothing more than an extra preseason game. At least in this one, they got three points for it. What were your thoughts on this opening Saturday of the Premier League? Did you have any issues with the new Fox Soccer Online product? Let us know by using the comments below. Wow, I actually beat the expert...Johnathan was (2-6) and i was (5-3) on today's games missing with Wigan, Everton and Man City. Johnathan read my mind when he stated "disappointing day" I concur. More shortly. Rarely do I ever get one hour to read this stuff as I am somewhere or at UCLA football. Got till 3 when Galaxy-Red Bulls. Today 8 games=21 goals for 2.6 average. Similar to last year and what MLS usually does. When can we see a league get to 3.0? Is it that hard for entertaining futbol and players that can finish? If it was not for Chelsea (6) and "stunning" Blackpool (4) the average would be awful. System issues, "i was actually last post anonymous" On today. Who could really think Chelsea, despite beating garbage would not have great chance to repeat. They scored some easiest goals you will ever see. Drogba scored 3 but I could probably have had 2 of them. Even though Benayoun did not start to me he replaces Cole adequately. He was one of Liverpool's bright spots a year ago. The marquee highlights of Week 1 opening day was this game and Man City-Tottenham, with Blackpool shock. Man City who I picked to finish ahead of Tottenham was lucky to get draw. Tevez not great, Abedayor should have started. Say what you want about him but he is pretty consistent scorer. Mancini looked brilliant promoting Hart over Given. If Given is not the present and Hart the future, maybe he can be sold to Arsenal to give them better chance of winning the league or finishing 2nd. They not likely going to help challenger. Hart was brilliant, especially the first 1/2 hour. It was a 30 minute clinic, rarely as good seen. For future reference, please limit all comments to one possibly two in a row. To me, you are bordering on spamming. I am going to be removing the 'test' comment. As for Wellbeck, he has not been sold. He is on loan for the season. Fergie figured that would be the best way to get him experience. While technology maybe a friend to all, please refrain from posting illegal video streaming sites on this site again. That comment will also be deleted as well. Today had the more of a NFL "preseason feel"
Louis Saha was non existent, Arteta and Cahill were hard to handle in 1st half but either a save or shots wide or just unable to get enough of a cross or centering pass. I am having the same problem with foxsoccer. tv I guess I'm sol.